Debra - this is amazing . I am only brave enough to draw one vegetable at a time ! I love the onion skin in the foreground and the way the vegetables are arranged. Did you "place" them or wa that the way they were sitting on the table? Ooh! Very nice! All those different whites! Those must have been fun! This is such a great composition! Great work! It must be a delicious soup! Humble veggies never looked so yummy! The dream of my life has been to find a household sous chef...so far no luck. Wonderful drawing--I just love to look at your drawings! The ingredients look just great! All we need now is cooking instructions :)! Fantastic - love the chopped onion detail in the foreground especially. Beautifully done and I bet the soup was good too! Absolutely stunning! I love those carrots! I am a big fan of your work and I am always amazed and very impressed with the little details you put in. Oh I bet this was a tasty soup! Wonderful drawing!! Wow, these are amazing. I love the reflection on the carrots, the papery look of the garlic, and the sliced open and chopped onion. I hope you enjoyed the soup! 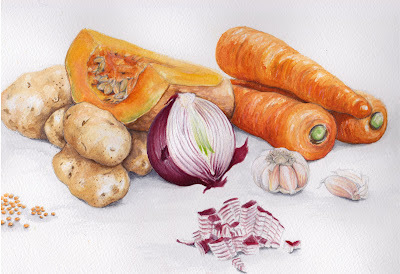 Ymmmmm, your drawing of the soup ingredients is making my mouth water. Will you draw the soup next? This is beautiful! Your colors are so vibrant on this drawing.